This is the moment of truth for Bernie Sanders and his supporters. It’s the moment that determines whether everything they’ve accomplished to this point is translated into real power and real change, or fizzles into nothing, leaving behind only bitterness and resentment. And right now, the latter course is looking much more likely. What happened in Nevada over the weekend was an expression of some key features of the Sanders campaign, even if it involved only a small number of Sanders supporters taking things to an extreme that most of them would never contemplate. It showed just how hard it’s going to be to convert the campaign into a lasting enterprise that has any influence over American politics. And at the moment, Bernie Sanders himself — the one person with the power to shape where this movement goes from here — hasn’t shown that he understands what’s happening or what he ought to do about it. To briefly catch up: In February, Hillary Clinton won the Nevada caucuses over Bernie Sanders by a margin of 53-47. But because Nevada is one of the states with absurdly arcane procedures involving multiple conventions leading up to the party gathering that took place last weekend which chose the final allocation of delegates, both campaigns did their best to out-organize each other in an attempt to win a few extra delegates. After some arguing and disputes over credentials, the party finally awarded more delegates to Clinton. Sanders supporters basically went nuts, with a lot of yelling and screaming, some tossing of chairs, and eventually a torrent of harassment and threats aimed at the state party chair. I’m not going to try to adjudicate what happened in Nevada, beyond saying that it looks like Clinton won the caucus, Sanders tried to work the system to grab some extra delegates, but then Clinton worked the system to grab them back, which doesn’t seem particularly unfair in the end. At the very least it was equally unfair to everyone. That doesn’t mean that Sanders hasn’t had some legitimate process complaints all along. When he says that the leadership of the DNC aren’t neutral but are basically behind Clinton, he’s right. And I get that Sanders is in an awkward position. Telling his supporters to tone down their criticisms lest they damage the nominee would mean acknowledging that he isn’t going to win, and doing that would demobilize his supporters. We should also appreciate that the Clinton campaign is all too happy to see this kind of meltdown, because it only makes Sanders and his supporters look like desperate dead-enders who can’t accept reality. And if she does become president, she’d probably be happier if she never faced any organized pressure from the left. But at the moment, Sanders has chosen to spend his time suggesting that the Democratic Party is corrupt, and any outcome other than him being the nominee just proves it. That is a recipe for the destruction of everything he’s accomplished up until now. This is the problem with framing your campaign and everything you want to do as a “revolution.” You can’t have a partial revolution; either you overthrow the old order or the old order survives. And Sanders is encouraging his supporters to believe that if there’s anything of the old order left, then all is lost. But the reality is that if the Sanders campaign is to become the Sanders movement — a force that has lasting impact on the presidency of Hillary Clinton and American politics more generally — it will only happen because he and his supporters manage to exercise influence through that system they despise. When he goes to visit Clinton in the Oval Office and tells her, “We still need a revolution!”, what is she going to say? Okay Bernie, thanks for coming, it was nice to see you. If he and his people want to actually exercise some influence, they’ll have to start thinking about mundane things like presidential appointments, executive branch regulations, and the details of complex legislation. Victories in those forums will be partial and sporadic. From our vantage point today, is there anything to suggest that’s an enterprise he and his people will be willing to devote their efforts to? What happens if Clinton offers Sanders something — changes to the party’s platform, or input on her nominees? Will his supporters say, “This may not have been all we wanted, but it’s still meaningful”? No, they won’t. They’ll see it as a compromise with the corrupt system they’ve been fighting, a sellout, thirty pieces of silver that Sanders ought to toss back in her face. That’s because Sanders has told them over and over that the system is irredeemable, and nothing short of its complete dismantling is worthwhile. This is the danger inherent in a critique that stands apart from substantive policy issues. The Sanders supporters who are now losing their minds certainly want the policy changes Sanders has advocated, like single-payer health care and free college tuition. But that isn’t what’s motivating them most powerfully right now. If it were, they’d be strategizing on how to maximize the chances of achieving those changes given the reality that Bernie Sanders is not going to be the next president of the United States. Instead, they’re most emotionally invested in the Sanders campaign as a vehicle of rebellion and revolution, a blow against that big amorphous blob of people, institutions, procedures and norms called “the establishment” or “the system.” Because they are convinced that the system is corrupt and only the Sanders campaign is pure, any loss by Sanders can only be evidence that corruption has triumphed. If more Democrats prefer Hillary Clinton to be their nominee, it can only be because the game was rigged. There are millions of people who voted for Sanders in the primaries and will happily support Hillary Clinton in the general election — indeed, that describes the vast majority of Sanders supporters. Even most of the core activists who made up his revolutionary vanguard will probably cast the same vote, if for no other reason than to stop Donald Trump. And many of them will take the inspiration they felt and the things they learned working on this campaign and use them in new efforts for change. But the idea of a lasting, effective movement led by Bernie Sanders and built on the ideals and goals of his campaign? That’s just about dead. Bernie Sanders gained a split decision in Tuesday’s presidential primaries, losing to Hillary Clinton by an eyelash in Kentucky and beating her by a more comfortable but reasonably close margin in Oregon. The net results won’t significantly reduce Clinton’s lead in pledged delegates, leaving Sanders with a nearly impossible task of winning the June 7 primaries by huge margins to overtake her. But again, it remains unclear whether Sanders will pack it in if he loses pledged delegates. Indeed, in a speech Tuesday night in California, Sanders simultaneously discussed the tough odds against winning a majority of pledged delegates and promised to “take the fight to Philadelphia,” apparently no matter what. 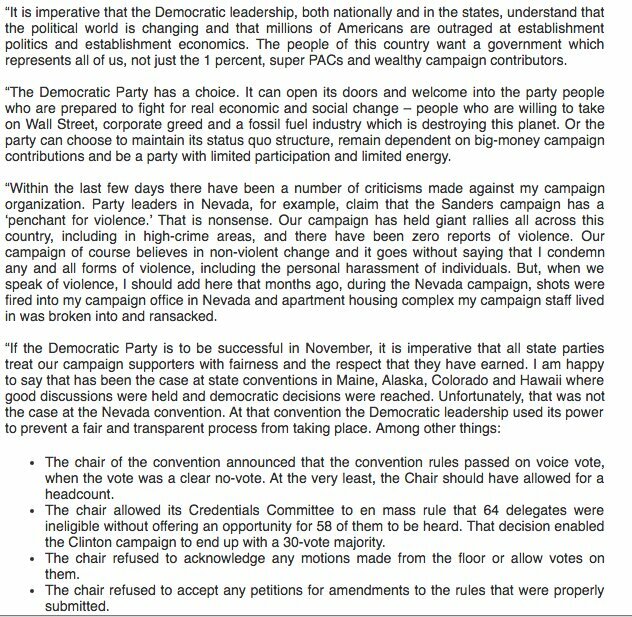 This ambiguous situation needs to be understood in the context of what happened this weekend in Nevada, where an ugly and fractious scene emerged at a state convention where four delegates to the Democratic National Convention were being selected. Veteran Nevada political reporter Jon Ralston watched it all and came away convinced the Sanders campaign had deliberately fed supporters spurious grievances over the rules in order to rationalize what was actually a fair-and-square Clinton victory in organizing for the event, which after all, simply confirmed Clinton’s earlier win in the February caucuses. By the time hotel security shut down the event late Saturday evening, the Sanders delegates had hurled ugly epithets at Clinton surrogate Barbara Boxer and used a sign to block her from being shown on big screens; they had screamed vulgarities at state chairwoman Roberta Lange, who later received death threats after Sanders sympathizers posted her cellphone number and home address online; and they threw chairs at the stage as they rushed forward to try to take control of a convention they had lost, just as Sanders was defeated at the February 20 caucus by Clinton in a decisive result. We believe, unfortunately, that the tactics and behavior on display here in Nevada are harbingers of things to come as Democrats gather in Philadelphia in July for our National Convention. We write to alert you to what we perceive as the Sanders Campaign’s penchant for extra-parliamentary behavior — indeed, actual violence — in place of democratic conduct in a convention setting, and furthermore what we can only describe as their encouragement of, and complicity in, a very dangerous atmosphere that ended in chaos and physical threats to fellow Democrats. [T]he Sanders people should know better than to conclude what has been a brilliant and important campaign by turning it into an extended temper tantrum. I voted for Bernie Sanders … But if anybody thinks that, somehow, he is having the nomination “stolen” from him, they are idiots. Nevada aside, consider the three arguments heard most often from the Sanders campaign against the unfair conditions it has endured. The first is that DNC chair Debbie Wasserman Schultz conspired to limit opportunities for candidate debates. That’s probably true. But there’s no particular evidence these events disproportionately benefited Sanders, who had no trouble getting to the starting gate with high name ID and plenty of support (viz the “virtual tie” in Iowa and his big win in New Hampshire). And she was forced to add some debates. Don’t know about you, but I feel like I heard from the candidates enough. The second is that closed primaries (aggravated in some states by very early deadlines for changing party affiliation) disenfranchised many Sanders supporters. Let’s be clear about this: None of the primary participation rules were set after the Clinton-Sanders competition emerged. States with closed primaries have for the most part always had closed primaries. Until this cycle, moreover, it was typically Democratic progressives, not “centrist” Democrats, who favored closed primaries as a way to elevate the influence of “base” as opposed to “swing” voters. In no way, shape or form were these rules set to thwart Sanders or candidates like him. And the third is that superdelegates (who at present overwhelmingly support Clinton) have tilted the playing field away from the people-powered Sanders all along. But Bernie’s people have a “clean hands” problem in making this argument, since they are simultaneously appealing to superdelegates to be prepared to deny the nomination to the pledged delegate winner (almost certainly Clinton) based on elites’ superior understanding of electability criteria. Beyond that, this is the ninth presidential cycle in which Democrats have given superdelegates a role in the nominating process. It’s not like it’s a nasty surprise sprung on the poor Sanders campaign at the last minute to seize the nomination for Clinton. But even if these arguments for a big Bernie grievance are pretty empty, you can appreciate that the close nature of this year’s nominating contest makes it easy to assume something fishy happened, particularly if you begin with the assumption, as some Sanders supporters do, that your opponents are unprincipled corporate shills. It’s like Florida 2000: In a race this close, you can blame the outcome on anything that makes you mad, from Joe Lieberman’s support for counting overseas military ballots to Ralph Nader’s presence on the ballot to dozens of single events like the Brooks Brothers Riot. For weeks I’ve thought and written that Sanders Camp Manager Jeff Weaver was the driver of toxicity in this race. But what I’ve heard in a series of conversations over recent weeks w/highly knowledgable people forced me to conclude that I had that wrong. It may be him too. But the burn it down attitude, the upping the ante, everything we saw in the statement released today by the campaign seems to be coming from Sanders himself. Right from the top. One thing is largely indisputable: Bernie Sanders himself could help clear the air by informing his supporters that while there are many things about the Democratic nomination process that ought to be changed, no one has “stolen” the nomination from him or from them. Perhaps a thousand small things gave Hillary Clinton an “unfair” advantage in this contest, but they were mostly baked into the cake, not contrived to throw cold water on the Bern. And the best step Sanders’ supporters could take to promote their long-term interests in the Democratic Party would be to get a grip before they wind up helping Donald Trump win the presidency. And Bernie Sanders himself has a responsibility to talk his devoted followers off the ledge. “State Passes Anti-Abortion Bill Described As ‘Insane'”: Don’t Policymakers In Oklahoma Have Real Work To Do? Republican policymakers in Oklahoma are aware of the fact that they cannot simply ban all abortions. The Supreme Court has already considered flat prohibitions and deemed them unconstitutional. The Oklahoma Senate on Thursday sent Gov. Mary Fallin a bill that would make it a felony to perform abortions in Oklahoma, despite a federal court case legalizing it. Senate Bill 1552, by Sen. Nathan Dahm, R-Broken Arrow, would also allow the revocation of medical licenses for physicians who perform abortions. The measure passed by a vote of 33-12 with no debate. The article added that there’s one physician in the state Senate, Republican Ervin Yen, who characterized the legislation as an “insane” measure that would invariably face a court challenge. Keep in mind, by approving a policy that’s obviously unconstitutional, and which is certain to fail in the courts, state lawmakers are asking Oklahoma taxpayers to foot the bill for a political exercise that will serve no practical or policy purpose. But just below the surface, there’s another nagging question: don’t policymakers in Oklahoma have real work to do? Why invest time and resources in a culture-war bill that will inevitably be struck down? This, evidently, was the prevailing attitude, which is why Oklahoma will soon have an unconstitutional ban on doctors performing a legal medical procedure, but won’t have a balanced budget.